A tub and shower combo kit is a perfect solution for small bathrooms to have the ultimate functionality for families who need both a shower and bathtub. 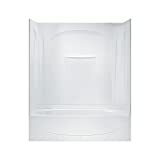 These kits are made to save room with their compact size while still giving you the option to use both a shower and tub. In this guide, we review four of the best tub shower combo kits that each offer different benefits and can meet a variety of budgets. Along with their essential features, we’ll also discuss how they differ from one another so that you can find the one that has what you need and want in your bathroom. Sterling Plumbing Ensemble Bath and Shower Kit has a high-gloss finish that looks modern and classy while also making it easy for you to keep clean. 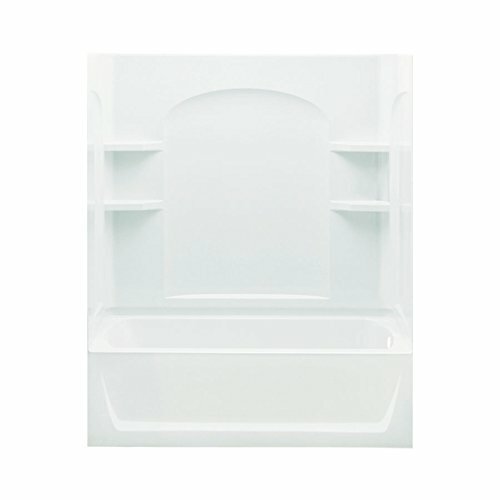 The Sterling Plumbing Tiled Bath and Shower Kit gives a classic tiled design to your tub and shower area, while also providing several storage shelves in the corners for convenience. 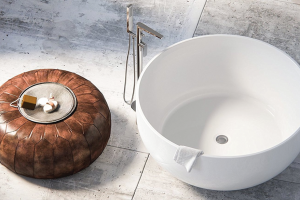 Sterling Plumbing Ensemble AFD Bath Tub and Shower Kit has the highest tub of all the options in our list, which can be an excellent choice for people who love deep soaks in the tub. Sterling Plumbing Acclaim Bath and Shower Kit can be a great option for giving some visual appeal to a contemporary bathroom design with its arched lines and high-gloss finish. Here, we look at our four top choices for the best tub shower combo based on their quality, functionality, and customer satisfaction. This Sterling Plumbing bath and shower combo kit is one that will likely match just about any contemporary bathroom design. With both sharp and curved lines, it can help focus the eye to its appealing design. This kit is made from Vikrell material, which is a stone resin composite that’s compression-molded to stay strong and unyielding. The kit comes in four separate parts that piece together in a modular way to make it easier to move through the home and bathroom for installation. 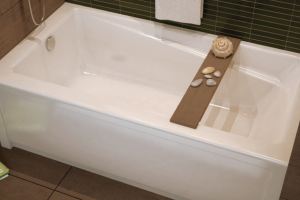 The tub is 18-inches in height, which can be great for people who enjoy high water depths in the tub. The bathtub should hold up to 55 gallons of water. People who have purchased and installed this unit commonly say that it was simpler to install than they expected, and it makes for a quick and easy upgrade to their bathroom. This bathtub and shower kit by Sterling Plumbing sits at a similar price point as the previous option on our list and offers several of the same features, including a narrow design that can fit into tight spaces and an 18-inch apron for a deep tub soak. The main difference in this kit is its look. If you love tiled shower designs, then this one will be a better option for you. With a mock-tiled background and several color designs, you might find that this combo kit offers a nice upgrade to the bathroom by adding a little character to your shower and tub area. Since there’s no grout to worry about, the tiled wall surround is much easier to clean than regular tiles. You’ll have four corner shelves on which to store your bath products, and the rim around the tub can also aid in storage, although some customers say it would be nice for the unit to have larger shelves for tall or wide items. Another popular kit with a contemporary design from Sterling Plumbing, the Ensemble AFD shower, and tub kit gives you a way to makeover your bathroom on a budget while getting a long-lasting tub and shower space. This kit has the deepest tub out of the options in our guide, with a 20-inch apron that’s great for deep soaks in the tub. The tub also has a reclining back area that can let you lie down comfortably as you relax in the bath. You can store bath items on the four corner shelves, and there’s a narrow shelf on the back wall that’s the right size for small items. Customers are pleased with this kit’s simple modular installation, which comes in four pieces using hook-together construction that forms a tight seal to prevent water leaks and mold formation. If your family needs an accessible tub and shower kit that makes it easy for kids, the elderly, and others to get in and out of the tub, then the Sterling Plumbing Acclaim kit may be your best option. 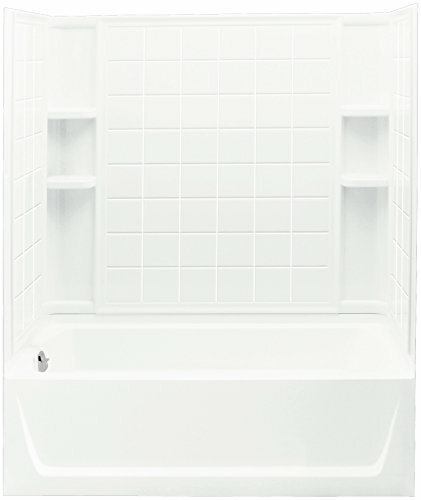 This tub is the lowest of the options on our list at only 15-inches in height, which doesn’t make it great for people who like to soak, but it does meet handicap standard ICC/ANSI A117.1 for accessibility. The arched and high-gloss design can work well with modern and contemporary bathroom designs while also creating a smooth finish that makes the surround and tub simple to keep clean. 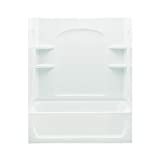 A common complaint of this kit is that it’s very limited in storage with its one small shelving unit on the back wall, so you may need to purchase a separate in-shower storage rack to hold bath products. Tub and shower combos come in many styles and with a lot of different features to match both the functionality needs and design preferences of your family. This guide explains some of the crucial elements to consider before you make your purchase. Bathtub and shower combo kits can meet a variety of budgets, as you might expect. While some cost as little as about $350, others can move up into the $1,000 range or more. There are a lot of reasons for the broad range in price, but what it mostly boils down to is quality. You shouldn’t expect to get the same quality in a $350 kit as you would a $1,000 kit. Some combo kits are constructed with lower-quality materials to make the price more accessible for most families. Your budget is just as important to stick to as finding a quality kit that will last as long as possible. Balance is key here. 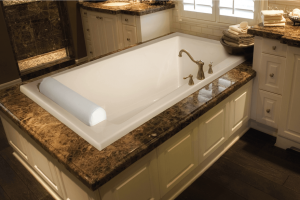 Even if you’re on a tight budget, you can typically find a quality tub and shower combo kit that will give you the basics you need while still meeting your expectations for a long-lasting surround. Consider any features that might be nice to have but aren’t necessary. Scratch them off your list and make sure you’re only paying for things you consider essential in your surround. Acrylic surfaces tend to be the cheapest. They’re usually the ones you’ll find for the lowest price points because they’re not quite as thick and sturdy as other kits. The benefit of acrylic kits is that they’re usually easy to move during installation and they’re also relatively easy to drill into or cut if needed. Polystyrene is a durable plastic that’s on par with acrylic. These kits tend to fall in the $400-$600 range and can feel a bit stiffer than acrylic kits. High-impact polystyrene is a standard material on many modern surrounds that helps lower costs but still allows the kit to stand up to wear and tear. Fiberglass kits fall in the middle of the pack in price, averaging between $500 and $800. They’re typically stronger than acrylic so that they may last longer than that or other less expensive materials. You’ll likely notice that this material is stiffer than acrylic, so you might be able to hold more on the surround’s shelving units. Fiberglass is usually more scratch-resistant than acrylic too. Premium composites are at the max end of the budget, heading into the $1,000 or higher range. However, if you can afford that price point, these tub and shower kits can give you the most quality for your money. These kits tend to have the longest lifespan because of how stiff they are, and they can also resist scratches the best. On the downside, they’re difficult to install and cut to fit your space. 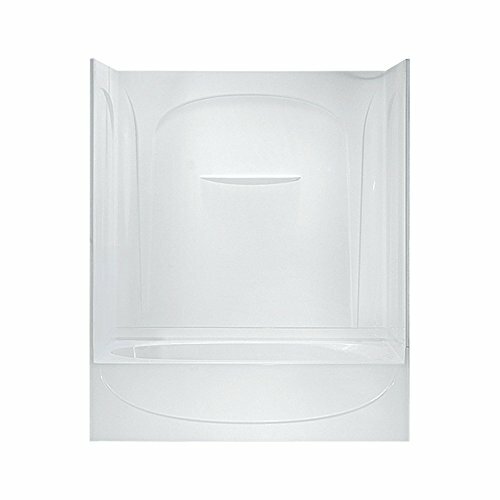 A bathtub and shower combo kit will come with the drain openings on either the right or left side. This is an easy thing to overlook when you’re looking for a new kit, but it’s an essential feature to keep in mind to make sure your kit fits into your current design. Most kits will come with a right-hand and a left-hand drain version so that you can choose the one that matches your current design, but you’ll need to make sure you’re choosing the right one before ordering to save time and the hassle of returning and waiting for a new one. Installing shower and tub combo kits aren’t easy, so it helps to have some experience with previous installations and plumbing. If you don’t, it might be wise to consult with a professional to get some help to ensure that your purchase is sealed correctly and will last as long as possible. You may also want to have a professional help you pick the right kit for your bathroom if you’re unsure of how to take the measurements you need for proper installation. Although all four of the tub and shower kits on our list are ones we’d recommend for most homes, we’re especially impressed with the Sterling Plumbing Ensemble Bath and Shower Kit. 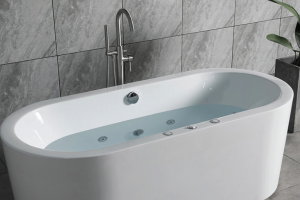 With its 18-inch tub height, it can meet the needs of most families who like an occasional soak in the tub but still want to get in and out with ease. 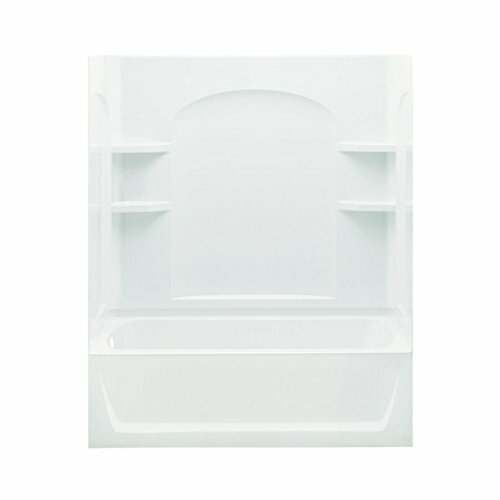 There are several storage shelves in this unit that are somewhat small but likely offer enough storage for most of your bath products. 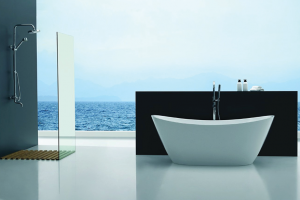 The glossy, sharp design should fit right into modern, upscale bathroom renovations. The easy-to-install modular design is a welcomed bonus, making the kit easy to move through your home and install without needing tools or caulk. Whether you choose this or a different kit, we hope that this guide leads you to find the best tub shower combo for your bathroom based on your family’s needs and design preferences.